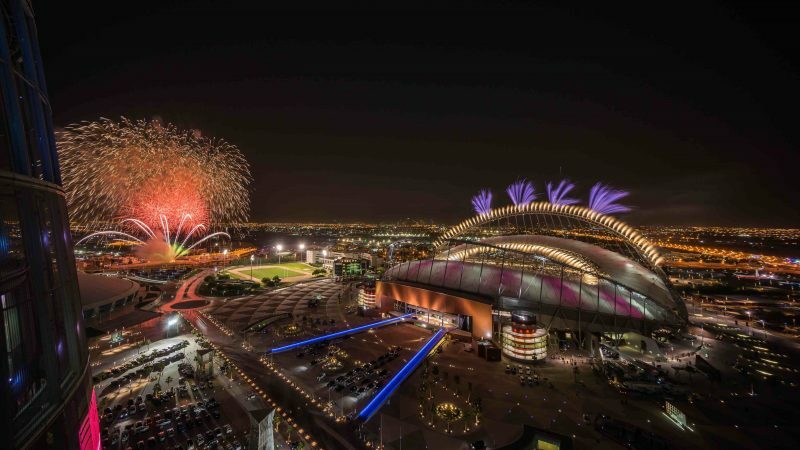 The host venue for the Middle East’s first-ever IAAF World Championships will be the iconic and technologically advanced Khalifa International Stadium. Khalifa International Stadium is a historic Qatari sporting venue that holds a special place in the hearts of people in Qatar, the GCC and the Arab World. Built in 1976, the 40,000-seater has long been the cornerstone of Qatar’s sporting tradition. It has played host to some of the most illustrious sporting events, including the Asian Games, the Gulf Cup and the AFC Asian Cup. Thanks to a three-year renovation and expansion project, the national icon was transformed into an ultramodern venue equipped with cutting-edge features such as air-conditioning technology, LED lighting and digital floodlights, providing optimal performance conditions for athletes and an unparalleled viewing experience for spectators. The groundbreaking cooling technology is 40% more sustainable than existing techniques and has been in use at Khalifa International Stadium since its reopening in May 2017. Located in Aspire Zone, Khalifa International Stadium is centrally-positioned near to several leisure spots and is easily accessible through a state-of-the-art road network, allowing guests easy travel to and from the venue. Location: Aspire Zone in Al Waab Area (14km away from the heart of Qatar’s capital, Doha). Foundation in partnership with the Supreme Committee for Delivery & Legacy (SC). 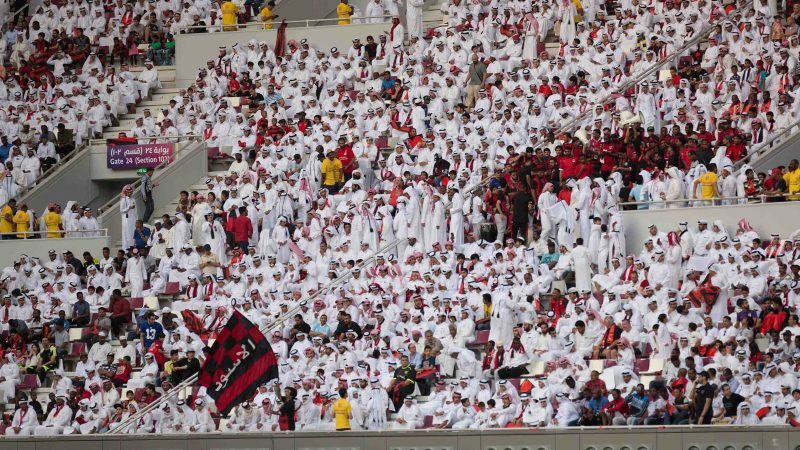 It included increasing the stands of the east wing of the stadium, increasing the seating capacity to 48,000, adding hospitality and VIP suites, constructing a sports museum (3-2-1 Qatar Olympic and Sports Museum), installing a state of the art roof to cover all stands in the stadium, in addition to installation of cooling technology that will keep the pitch to an optimum 26 degrees year round, using 40% less energy than conventional stadium cooling tech. 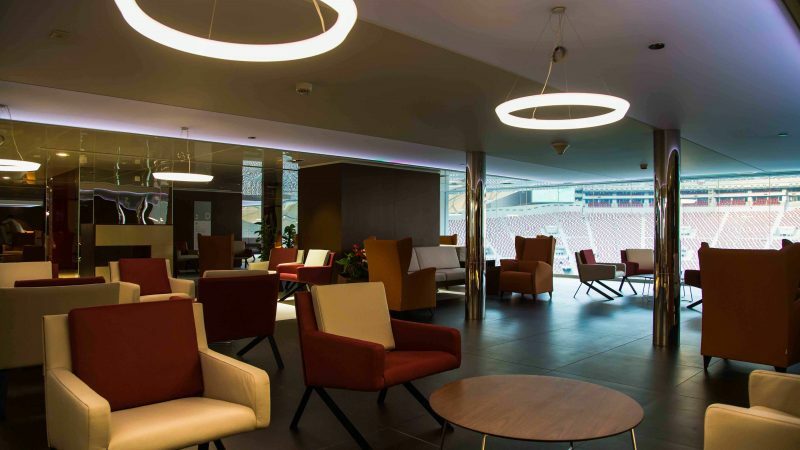 VIP Suites: Khalifa International Stadium will have 64 suites of varying sizes for different VIPs and companies. Parking: 6,000 car spaces and 2,300 bus spaces. Khalifa International Stadium will be connected to a metro station currently under construction, and will also provide accessible parking spaces near its main entrances. It will also include accessible drop-off zones as well as accessible entrances and elevators to ensure people with disabilities are able to reach their seats easily and comfortably. 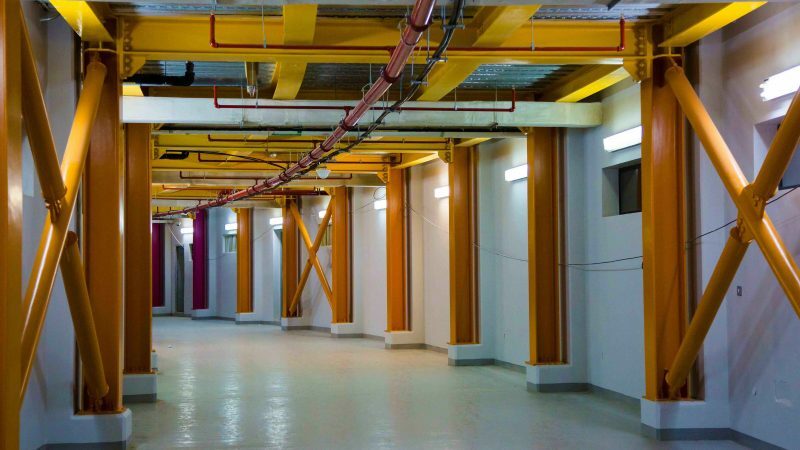 The recent renovation process included the construction of a sports museum (3-2-1 Qatar Olympic and Sports Museum), a multipurpose hall, VIP areas, and an area for shops, restaurants and a fitness centre. The VIP suites include unique designs combining Qatar’s cultural heritage and elements of the modern architectural character of Doha. 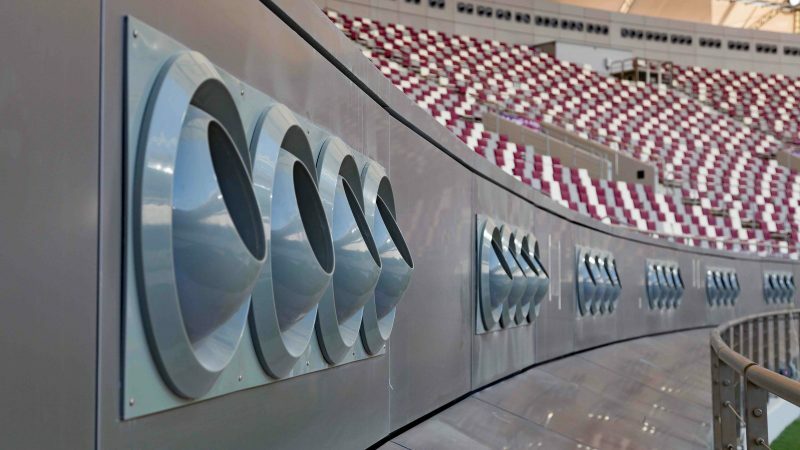 Innovative and environmentally friendly cooling technology has been installed at Khalifa International Stadium. The technology uses district cooling, air treatment and smart control systems to deliver an optimal environment for spectators and players alike. It is able to lower the temperate within the stadiums to 21 degrees Celsius when outdoor temperatures are around 40 degrees Celsius. The technology distributes cooled air with the aim of cooling spectator stands, the pitch and decreasing the amount of hot air entering the stadium through its open roof. These units have been installed in specific locations around the stadium including the pitch, upper walls and stands of the stadium in accordance to various studies that were conducted during the design process. 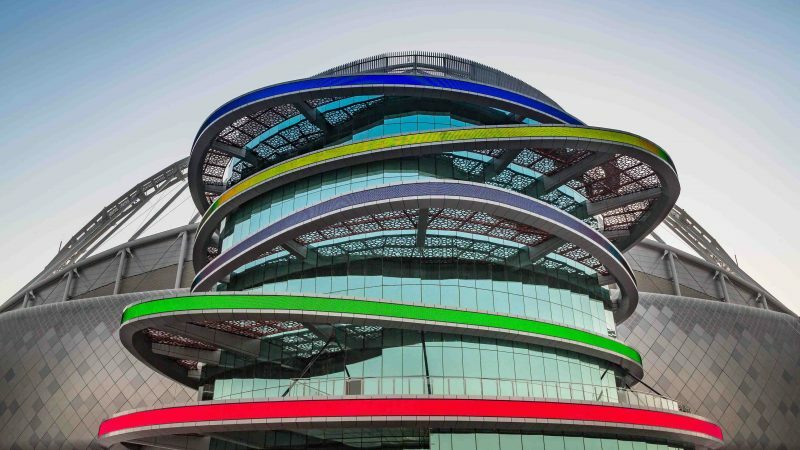 Khalifa International Stadium focuses on sustainability as a key element in its design and operation, and has achieved a four-star GSAS rating – making it one of the most sustainable stadiums in the region. Khalifa International Stadium has been completely fitted with natural turf that can withstand the Qatari climate and has the highest resistance. The turf is a hybrid, with one developed by Oklahoma State University in the United States and the other developed locally. Planting it took nine months in Aspire Zone Foundation’s turf nursery until it reached 14mm in length and was ready to transport and install at the stadium, which has a total floor area of 7,848 square metres. Khalifa International Stadium achieved a new world record for the returfing, completing the project in just 13.5 hours (European standard is 18 hours). More than 80 pieces of equipment and machines were involved in returfing the stadium, carrying 8,250 square metres of natural grass from the turf nursery, located 5-km away from the stadium, and was installed by more than 90 employees and workers. The process started at 5.00 AM on the 16th of April 2017.